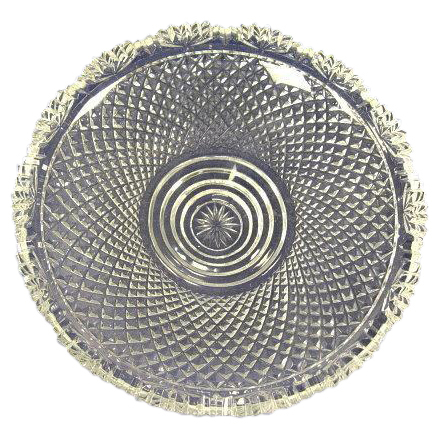 If You Are Looking For Replacement Crystal Bowls For Your Antique Epergne's, I Have A Vast Selection Of Over 1000 Pieces. Individual Bowls Or Sets. Small & Large. All Cuts, Styles & Periods. This Set Consists Of The Large Center Bowl, And 4 Matching Side Bowls, All In Perfect Condition. This Will Fit Most Centerpieces, As It Has The Stepped Bases That Will Sit In Most Frames. If You Only Need 3 Side Bowls, I Can Discount The Set By $150.00.. If You Are Looking For A Different Style Or Cutting, Send Me Your Measurements, And Perhaps A Photograph Of Your Piece, I Can Find You A Suitable Replacement.. We Are Also Able To Copy A Rare Crystal Piece By Re-blowing & Hand Cutting To Your Exact Specifications, But This Does Take Time, And Is A Lot More Expensive.. Feel Free To Contact Us For Further Information ... We Also Have A Great Selection Of Antique Silver Epergnes In Our Large Ever Changing Inventory..